"The Gutenberg Revolution: A History of Print Culture describes the history and impact of the radical printing revolution, starting his narrative from the eighth century to the Renaissance and considering the new Christian and classical world fostered from the new print era. Gutenberg's innovation truly changed the world: this focuses on how the Cultural Revolution was shaped by printing and is a scholarly survey recommended for history and literary collections at the advanced high school to college levels." "Of special note is Richard Abel's 'Epilogue: Closing Remarks and Summary'. Enhanced with the inclusion of an extensive bibliography and a very useful index, "The Gutenberg Revolution: A History of Print Culture" is a truly informative read and should be considered a mandatory acquisition for academic library Writing/Publishing reference collections and supplemental reading lists." "Richard Abel's "The Gutenberg Revolution: A History of Print Culture "is a scholarly and passionate opus that demonstrates how printing permeated every aspect of life throughout the Renaissance. Covering the eleventh through seventeenth centuries, the book reflects the author's rich life as scholar, historian, editor, publisher, bookseller, and writer. Illuminated by a resolute search for the good and the true amid the turmoil of transforming centuries, "The Gutenberg Revolution "should be read by anyone seeking a thoughtful perspective on the twenty-first century, for which, Abel demonstrates, the pre-and post-Gutenberg centuries have powerful messages." "[I]t is thrilling to view Western history afresh through the prism of printed books as the engine of knowledge. As we try vainly to predict the social and epistemological consequences of the Internet, Abel's history not only limns a still-neglected history, it stands as a rare tribute to his forebears in publishing." 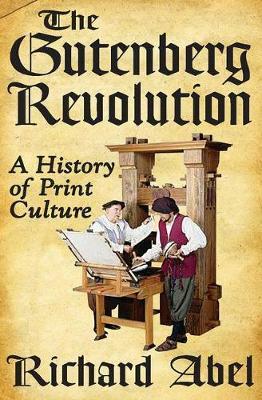 "Richard Abel's The Gutenberg Revolution: A History of Print Culture is a scholarly and passionate opus that demonstrates how printing permeated every aspect of life throughout the Renaissance. Covering the eleventh through seventeenth centuries, the book reflects the author's rich life as scholar, historian, editor, publisher, bookseller, and writer. Illuminated by a resolute search for the good and the true amid the turmoil of transforming centuries, The Gutenberg Revolution should be read by anyone seeking a thoughtful perspective on the twenty-first century, for which, Abel demonstrates, the pre-and post-Gutenberg centuries have powerful messages."